Molecular Gastronomy is a term that has gotten alot of attention over the years. A more fitting term is modern cuisine, but whatever you call it you have definitely heard of emulsification, spherification, foam and powders! For those of you that think it is about using “unnatural additives” you have another thing coming to you. All of the additives used in modern cuisine are plant derived, and furthermore you are already consuming them in your everyday food products, you just don’t realize it. I’ll explain more below. For now, lets talk about powders. 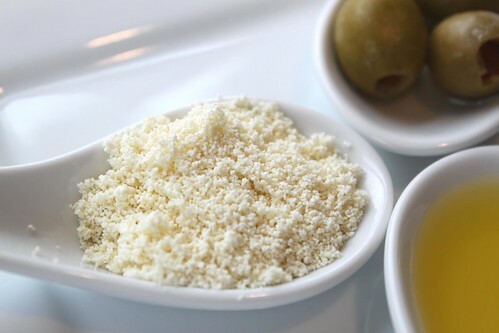 One of the easiest things to make is powders using Tapioca Maltodextrin, but before delving deep lets talk about what is Tapioca Maltodextrin, where it comes from and how it works! Maltodextrin is quite simply a food starch. Most starches like flour take in and can thicken water and sauces. Maltodextrin does the opposite. It absorbs and thickens fats. It actually hates water and will turn into goo on contact. On a more molecular level, Maltodextrin is a dextrose (plant sugar) polysaccharide. Polysaccharides are long carbohydrates made of monosaccharides (repeating units). They are able to encapsulate the oil and hold it within the powder until it comes in contact with water and then it releases the fat/oil. The polysaccharides form a 3D network that entrap the oil droplets and don’t let them move, hence stabilizing the emulsification. Maltodextrin can be derived from different plant starch sources, the most common being from corn in the US, wheat in Europe and the other from tapioca. Tapioca is processed from dried cassava roots (native plant of South America) and is used for cooking in different cuisines. That tapioca maltodextrin is the one you need for creating powders. The corn maltodextrin is more commonly found in soda, beer, and even salad dressing. It is used in beer to improve the smooth mouth feel and it is used in salad dressing to prevent separation of the oil and water. The Tapioca Maltodextrin has no taste to a slightly sweet taste. It is sold as a white powder, or in flakes or spheres. Usually you need to parts Maltodextrin to one part oil to create a good powder. Also never store it uncovered, always in a sealed container. 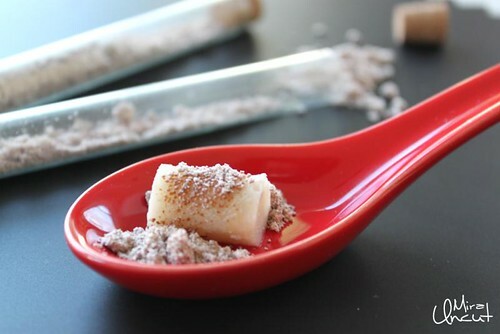 Some ideas for some powders you can easily create are: nutella, peanut butter, olive oil, caramel, truffle oil and whatever else you can think of. Made some lately? Share your link below so I can check it out.